I don't have much to say about this hymn, other than I find the music somewhat boring. The text is marvelous! It's a beautiful prayer that can work well for a funeral as well as a general service. Isaac Watts, the poet, is one of the best and most famous of hymn writers ever. His gorgeous text deserves a lovelier setting. I'm sure many would find it blasphemous to create a new version of a hymn that appears in almost every Christian hymnal. But, that's what I'd suggest. An entirely new setting. The tune is fine in the first half, but then it gets all jagged and jumpy in the second half. I feel like I don't know where I'm going. Maybe Croft was trying to depict the "stormy blast" by leading us on a melodic, if not wild, then at least 'squirrelly' goose-chase. I'm not sure why we need a doubled 3rd on the 3rd chord of line 1 or the 3rd chord of line 2. I don't care for that unbalanced sound. And the D minor chord, the 3rd chord from the end, that one always stands out like a sore thumb to me. I can't quite figure out why except that it continues the wandering of the melody a bit. I'd rather hear, after all the jumping around that came before, a final melodic C-C-B-C. Some steadiness. There are a couple nice secondary dominants, but they kind of add to the wandering of the 2nd half of the tune, at least in my mind. I'm sure I'm putting some noses out of joint with my less than excited feelings about this piece. As Forrest Gump would say, "Well... that's about all I have to say about that..."
We'll see below if "The Bench Warmer" has similar or different feelings about this one. P.P.S. 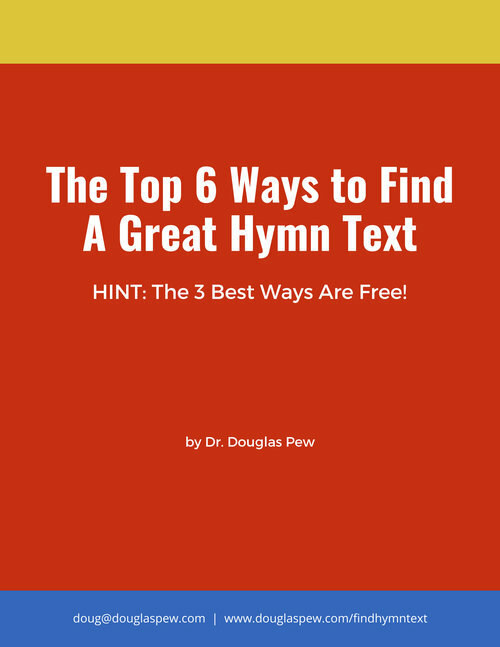 Need some help with your hymn or primary song writing? Or just another pair of eyes? Sometimes we get too close to our creations to notice some things that could be polished a bit. Apply for a hymn critique by clicking below and I'll help you sharpen up your hymn and get it ready for submission to the Church's new hymnal. This is a very familiar hymn across Christendom. This hymn might reside in just about every traditional hymnal printed in the last two or three hundred years. It is well-beloved and has withstood the test of time. Of the author of the text (who I think may be the greatest hymn writer of all-time), Karen Davidson in her hymnal treatise says “no hymn stands as a greater monument to the genius of Isaac Watts than this one.” I think this sentiment can well stand for both the text and tune as a great monument and as “one of the grandest in the whole realm of English Hymnody. It is found in practically every hymnal. No other embraces in such moving language the whole scope of history, faith in a God who realizes His purposes through history, and the solidarity of a nation which in times of crisis places its hope in the Eternal.” (Albert E. Bailey, The Gospel in Hymns [New York: Charles Scribner’s Sons, 1950], p. 54.) It is also worthy to note that this hymn, like many great hymns, finds inspiration in the psalms, which are treasures of artistic sung prose. The tune is St. Anne, composed by English organist William Croft. It is suggested that Bach used the melody as the first fugal theme in his Fugue in E Major, BWV 552/2. There is no evidence to suggest this hymn tune was known in Leipzig when Bach composed this great work, though it bears strong resemblance to the hymn. Thus the Prelude and Fugue in E Major BWV 552 has adopted the nickname “St. Anne.” I encourage you to listen to the entire work as it is masterful, but especially to the Fugue and determine for yourself if Bach may have been influenced by or used this tune as the genesis of the first fugue’s theme. This hymn is extremely dignified, so I would not play it too fast. The indicated tempo suggestion in the book is a good one, with 80 beats per minute perhaps even nudging on too fast. I probably play this hymn for congregational singing somewhere between 72-76. This is also a great hymn to find a wonderful, majestic, stately alternate harmonization to use. I use one by Noel Rawsthorne from his Two Hundred Last Verses publication. Worth checking out. If you don’t have an alternate harmonization, try playing the first four notes in unison and then going to parts on the fifth chord on the last verse. This is a wonderful spot to use a trick like that to great effect. I would be very bold and majestic in my registration. Feel free to use 16’ stops in the manual to add a tremendous sense of gravitas and profundity. Use of chorus reeds works well for this as well.